Cook Time: 1 hr. 40 min. Total: 2 hr. 25 min. 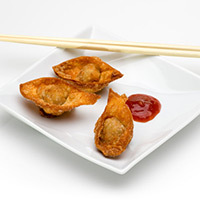 Crispy won tons stuffed with lamb and apricot will be eaten up quickly at your next gathering. For glaze, in 2-quart saucepan, combine preserves, 1/2 cup water, soy sauce, vinegar, and ginger. Bring to boil, reduce heat and simmer uncovered 3 to 4 minutes or until slightly thickened, stirring constantly. Combine lamb, carrot, radish, cashews, and 1/2 cup of glaze; add 1/2 cup water to remaining glaze and set aside to use as a dipping sauce. Place 1 tsp of lamb mixture in center of each won ton skin. Fold one corner over the filling to meet opposite corner and moisten edges with water to seal. Keep won ton skins and filled won tons covered in damp towels while you work so they do not dry out. In 3-quart heavy saucepan, heat vegetable oil to 360°F. Fry three to four won tons at a time, 1 to 2 minutes or until golden brown; turn over once. Remove and drain on paper towels. Serve with dipping sauce.